Throw-Back Thursday...back to Yellowstone and a photo to let you know that life there wasn't all warm sunshine and meadows filled with wildflowers! This is Pelican Valley, I think. It would have been fall (Sept or Oct) and we were packing in supplies for Fern Lake and Pelican Creek backcountry cabins. It was a little nippy! 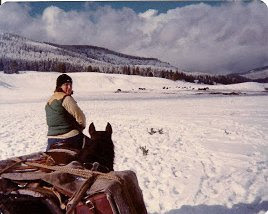 Here's a link to the Musings From Red Bell Farm blog post, The Yellowstone Years, that this photo came from.